How do you top Re-Animator, one of the funniest fright films of the 1980s? How do you top a movie that features a severed, undead head going down on a naked Barbara Crampton? Well, how do you? A difficult task, but it’s easily accomplished if you up the ante in terms of a great script, strong performances, and squirm inducing special effects/make-up. Under Stuart Gordon’s masterful direction, these elements come together seamlessly, making From Beyond one of the most enjoyable and most enjoyably disgusting horror films of the 1980s. The story is this: Crawford Tillinghast (Jeffrey Combs) has been confined to a mental hospital for the murder of his mentor, Dr. Edward Pretorius (Ted Sorrel), who created a machine called the resonator. The resonator stimulates the pineal gland, allowing us to see dangerous creatures that exist in a parallel dimension. The only problem is that these creatures can also see and harm us, even kill us, which is what happened to Pretorious, according to Tillinghast. Only the naïve Dr. Katherine McMichaels (Barbara Crampton) believes him and, with cop Bubba Brownlee (Ken Foree), she persuades Tillinghast to re-create the experiment. This works all too well and allows the monster that devoured and assimilated Pretorius to enter our world. This Pretorius-Creature promises that they will all soon join him and learn of the “pleasures” only it can provide. From here the film gets very, very weird and the less said the better off for any first time viewers. 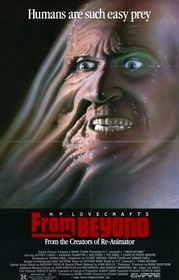 From Beyond is based on the same-named H.P. Lovecraft short story, but instead of being a straight adaptation, it acts more like a sequel. What remains of the original narrative is confined to a pre-credits sequence with Tillinghast and Pretorius. The rest of the film builds upon what has already been set up, while staying faithful to Lovecraft’s groundbreaking concepts. In the short story, Lovecraft suggested that a hidden world of monsters exists around us all the time, but we can’t see it. The screenplay – adapted by Gordon, Dennis Paoli, and Brian Yuzna – explores this further by looking at the resonator’s effect on the characters. Additionally, new characters such as Brownlee and Dr. McMichaels are invented to serve the expanded plot. For practical reasons, changes such as these are important because Lovecraft’s story runs a mere six pages; to make a wholly faithful adaptation would lead to a very short movie. Gordon and his collaborators manage to balance faithful adaptation and dramatic elaboration equally, never detracting from the story as a whole. Anyone who watches the movie without having read “From Beyond” the story wouldn’t miss anything important. By the same token, anyone who has read “From Beyond” the story would most likely enjoy From Beyond the movie. That is, assuming they have strong stomachs. When it comes to the special effects/make-up and gore, Gordon pushes it to such extremes that it becomes both surreal and visceral. The surreal aspect is seen primarily with the many transformations of the Pretorius-Creature. 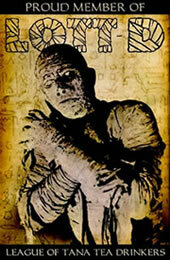 Over the course of the film, he changes form at least five times. Anyone else would’ve easily settled for one or two quaint little transformations, but Gordon pushes it even further and each is just as sick as the last. Body parts twist and contort to create new shapes while slimy goop drips out of every pore. It’s all wildly disgusting and eye-popping stuff and you can easily imagine Stuart sitting behind the monitor, chuckling to himself and screaming for more. However, these are also scenes that make you cringe and squirm in your seat because for all of the outrageousness, it has to do with the breakdown of the body and nothing hits harder than how disgusting the human body really is. As with any monster movie, the special effects/make-up are just as much the stars of the film as the actors are and From Beyond is no exception. A majority of the special effects and makeup are used to bring the Pretorius-Creature to life, as well as his many different transformations and appearances. They literally stretch the boundaries of what the body is capable of until it becomes a writhing mess of bodily horror. However, some of the effects are rather low-key. Spoilers ahead: For example, when Tillinghast undergoes a transformation, his pineal gland bursts out of his forehead, becoming another limb that gives him a sixth sense (No, he cannot see dead people). It’s a rather subtle effect when compared to the rest of the film, but one that is incredibly effective. Stuart Gordon’s direction of the actors is just as strong as his previous endeavor, Re-Animator. Unlike so many horror films, he does not create one dimensional, cardboard cut-out characters that scream and fall down when something horrible starts. Instead, he works to get very realistic performances from the actors where you sympathize with them and you feel for them as they go through horrific events. Jeffrey Combs, as always, steals the film right from the other actors and you are drawn to him the most. This doesn’t mean that the other actors’ performances are lackluster; it’s just that Combs has a more captivating role, delivering a performance that is sympathetic and tragic. In the beginning of the film, we see him as slightly traumatized by his experiences with the resonator. He is reluctant to re-create the experiment, yet he is forced to or he will spend the rest of his life in a straightjacket. We understand that he does this not because he wants to, but because the alternative is no better. Halfway through the film, he becomes a victim of the resonator’s effect and becomes a monster with very little control over his actions. At the end of the film he overcomes his monstrous desires and sacrifices himself to save Katherine, the woman that he’s grown to love and care for. Over the course of the film, he makes the transition from traumatized scientist to brain-eating monster to courageous hero. Hats off Mr. Combs; you should’ve gotten an Oscar. From Beyond is a very overlooked and underrated film that combines a great script, masterful direction, a strong central performance by the inimitable Jeffrey Combs, and nauseating special effects/make-up. Highly recommended for horror buffs, but not recommended for the easily offended or squeamish. Do yourself a favor and watch it with friends one night, preferably while eating gingerbread men. Submitted by mido (not verified) on Mon, 2010-01-18 17:13.
its a fantastic movie i have ever seen . thanks alot .